Why? Because we were drinking (sort of). 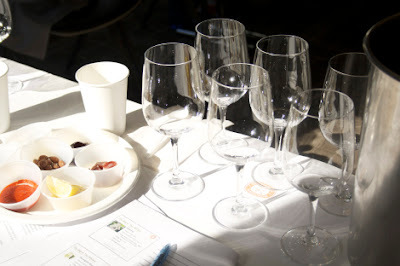 The taste test was arranged so you could learn how to pair certain flavors with particular characteristics of the wine. The first thing we learned was that two like flavors, say sweet and sweet, won’t make each other stronger. In fact, if you eat a chocolate bar and follow it up with a sip of coke, your coke will taste more bitter than sweet. The same applies to wine. So we tested the theory with a sickeningly sweet Riesling. To temper this sugary wine, we matched it with the flavors of pad thai: We took a spoonful of jelly, a dollop of hot sauce, a squeeze of lemon, and a pinch of salt. The sweetness of the jelly mellowed the wine while the spice and acidic notes complimented the sugar. We did the same thing for acidic wines. If you take a sip of a white wine that makes your face pucker and leaves your tongue dry and chalky, it’s probably a Sauvignon Blanc. This grape is dry (little sugar) and acidic, and will pair perfectly with a salty and acidic food. The acidity will cut the acid in the wine and the salt will balance the acidity (think: fish in a lemon sauce would be the perfect food to eat with a Sauvignon Blanc). Our Chef told us to taste a spritz of lemon seasoned with salt, and then re-taste the wine. And when we did, the wine became smoother and fruiter. It’s like witchcraft–try it the next time you’re throwing a dinner party. 1. 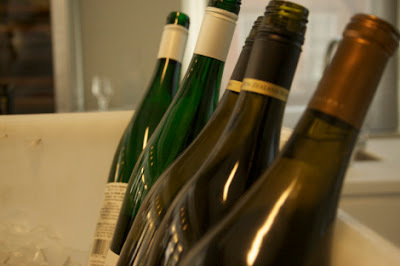 Riesling: Can be sweet or bone-dry (no sugar), low in alcohol, and high in acid. If you want something sweet, ask your waiter or wine-store manager for a sweet Riesling. 2. Sauvignon Blanc: Moderate alcohol levels, rarely oaked (matured in wooden barrels that give the wine a vanilla aftertaste), highly acidic. 1. Pinot Noir: Mildest of the red wines thanks to the lack of tannins, which will leave your mouth feeling dry and chalky. Light body, earthy flavor, and will smell like fresh dirt. 2. Merlot: Stronger in flavor than a pinot noir with hints of dark fruits like cherry or plums. Has more tannins than a pinot noir, but less than a Cabernet Sauvignon. Richer flavor than a pinot noir. 3. 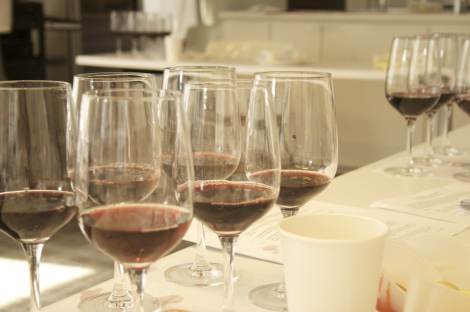 Cabernet Sauvignon: Darkest of the red wines with the highest count of tannins. You’ll hear people throw out buzzwords like coffee, chocolate, or tobacco when assessing this wine. If you like a heavy red, go with a Cab. Or if you’re eating a juicy steak. So what happened to Syrah? It’s not considered one of the original six grapes, but was recently developed, and is the same thing as “Shiraz” (just the Australian name for it). It’s an economical grape since it does well in poor soils, and has an intense, fruity, and spicy flavor. *And if you like wines that have more intense, fruity flavors and less acidity, choose a wine from the “New World”–basically anywhere not in Europe (think: South America, Australia, New Zealand, etc.). Sara Cann is a Classic Culinary Arts student who took a break from the magazine editing world to test her chops in a kitchen. The outcome? Who knows. But you can follow her culinary adventure on Fork Adventures. I arrived at Pier 54 at 9:00am on Sunday morning. 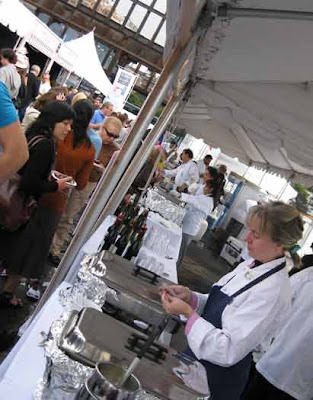 The warmth of the sun began to wash over everyone as they scrambled around readying up for the first annual Taste of France. The first event of its kind, it was a celebration of all things French, an exhibition dedicated to highlighting the French way of life and cuisine in New York City. A sense of grandeur was abundant, as many chefs from all over France and the United States enveloped the scene. With chefs from areas such as Alsace, Normandy, Provence, Cote D’Azure, Aquitane, Gascony, and everywhere in between, the entire event represented all of France as a unified nation of excellent food, music, and overall allure. I worked under The International Culinary Center’s very own Chef Marc Bauer as he led me underneath one of the tents setting up to have food available for the public as they arrived. As we prepped, the wonderful scent of soups, fine wines, and pastries lifted everyone’s spirits up and lingered for the most part of the afternoon. A stage was set up with large speakers long before we arrived and soft, gentle French music filled the ears of guests as flavors engulfed their palates. 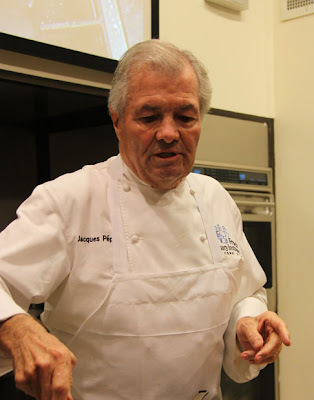 Everyone was having a good time, with many events like péntaque, a popular form of boules, a French Bull dog show, and special ambassadors such as Jacques Pépin and Marc Murphy who took the stage to speak about their passions and what makes them tick. The entire event was set up to look like an old French flea market, or marché aux puces, with stands giving off exuberant smiles and free tastings of all they had to offer. I served guests that brought me tickets called Mariannes, the official currency for the event. 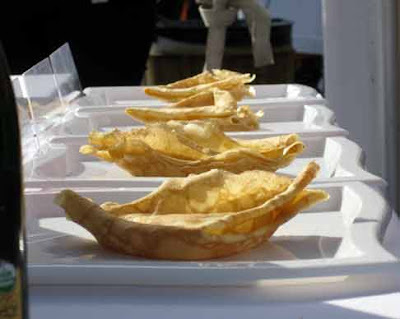 We also served cannels, a dumpling like piece of dough with yellow back pike-fish and a delicious lobster cream sauce as thick and tasty as any bisque served in a restaurant. To the left of our tent, two other chefs were preparing crêpes with a variety of toppings. Nutella, apricot and raspberry preserves, and the always enjoyable crêpes Suzettes made with Grand Marnier, a caramelized sugar sauce, and orange zest. Another favorite of guests was the curried pumpkin soup, not too sweet, but also nicely spiced. The event was great for a large assortment of foods and for anyone looking to get a taste of France all the while living in New York City. While it was the first event for this year, please make sure to come out next year and experience all we had to offer! John Balogh is a current International Culinary Center student in the Classic Pastry Arts program. I graduated from the Classic Pastry Arts program at The International Culinary Center this past June. At first I was relieved to be done with exams and have Friday nights free (I was taking the Monday, Wednesday, and Friday evening course). 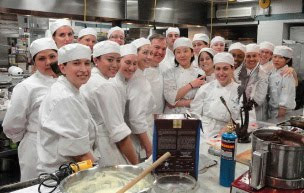 Now, three months later I'm really missing school and I find myself reminiscing about my classes, none more so than the chocolate class that Chef Jacques Torres taught. 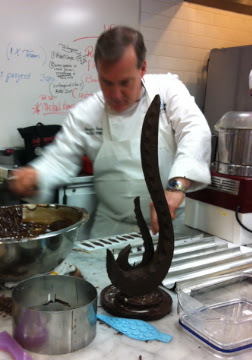 Chef Jacques with the main structure of the showpiece. The blue thing in front of the showpiece is one of the silicon molds that I discuss below. We had a chocolate showpiece project coming up, so Jacques Torres--or Chef Jacques as we were told to call him--demoed how to make a chocolate showpiece. He talked about finding the focal point, designing a shape that is pleasing to the eye, and the proper proportions of width to height. He showed us how to mold odd shapes out of chocolate using rubber or cardboard bands (which enable you to make the piece thicker than you could if you were trying to cut it out) and how to use metal rings to mold the circles for the base (again, this makes things thicker than if you just cut out the shape). That's how he made the main structure of the showpiece. Chef Jacques making flower petals and the tuile mold used for curving them. 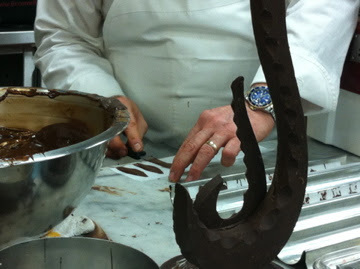 Also you can see the notching in the edges of curved pieces of chocolate that form the showpiece's structure. He also showed us how to make abstract flowers (by forming petals with a paring knife dipped in chocolate and curving them in a tuile mold) and paint chocolate onto textured molds—in this case to make wings for a butterfly and leaf-like decorations for the base. He taught us how to cut fluted edges out of chunks of chocolate and glue everything together. One of the best construction tips was to cross-hatch the surfaces you will be gluing together before you pipe or spread on the untempered (yes, untempered) chocolate "glue." Finally, he showed us a really cool technique to make a kind of dough out of chocolate that will harden properly (in contrast to modeling chocolate that doesn't harden completely). You put chocolate (regular old pistoles or chunks from a bar of chocolate) into a food processor and blitz until the chocolate becomes a dough—this may require adding a bit of external heat, but don't use too much or it will melt as Chef Jacques so helpfully demonstrated. Once it forms a stiff dough you can mold it like clay into complex shapes, in this case, the stamen of the flower, antennae for the butterfly, and decorative curvy bits to add movement to the top of the showpiece. These decorations, plus a little bit of petal dust on the butterfly, made for a beautiful showpiece. The most amazing thing about it is that Chef Jacques made it from scratch in about two-and-a-half hours, including gathering his equipment! (To give some perspective, we had more than eight hours to make our showpieces.) I have to say, this lesson helped me feel somewhat more confident about being able to make my own showpiece... not to mention, it gave me some really great ideas for techniques I could use. I did end up incorporating some of the things he talked about (the metal ring mold trick and the cross-hatching technique both came in handy) but my well planned showpiece was not half as impressive as the one that Chef Jacques made, from concept to final product, in a couple of hours. I guess they call him Mr. Chocolate for a reason! Mercedes Wilby is a graduate of The International Culinary Center's Classic Pastry Arts program. On her blog, Pastry Place, she chronicles her culinary exploits at The International Culinary Center, throughout NYC, and in her own kitchen. What a difference nine months can make. I started in the inaugural Classic Culinary Arts Honors Program at The International Culinary Center, founded as The French Culinary Institute on December 29 of last year. When I started this program, I was, for the most part, unaware of celebrity chefs and other well-known icons of the culinary industry. That is, until André Soltner came to talk to our class, giving us a demo on knife cutting techniques. André Soltner is perhaps most well known in the US as the owner and executive chef of Lutèce, where he thrived for over three decades and raised French cuisine to an art form in New York. What is so amazing is that he is self taught, having started in kitchens at age 15. He worked his way to the top of his game, and he’s now giving back to the education of future chefs as dean at The International Culinary Center. Who would even think it possible to cut a potato into a chain? Let me attest to the fact that it is totally doable. You, too, will be able to accomplish this after reading this blog post and trying it yourself. 1. Wash and remove the skin from a large starchy potato, e.g., Idaho potato. Once peeled, put into acidulated water or water with a squeeze of lemon juice briefly to prevent it from oxidizing too quickly. 2. 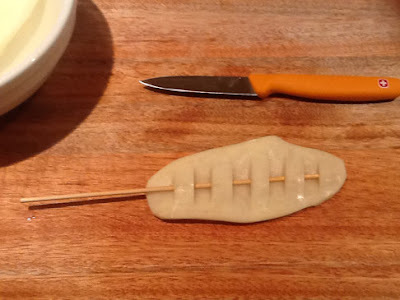 Cut the potato lengthwise into planks about 2/10ths of an inch thick using a chef’s knife. 3. Take one plank you’ve just cut (be sure to work on one plank at a time) and cut slits in it about a centimeter apart using a paring knife. 5. Cut from the outside to the center, being sure to cut all the way to the skewer (you will want to be able to remove the skewer through the side cut you’ve just made. 6. Insert the skewer again weaving it in and out of the slits (be sure to weave it in the opposite direction from the first side; i.e., if you went over-under first, now you weave the skewer under and then over. 7. Just as you did in step five, cut from the outside to the center, being sure to cut straight through to the skewer. Remove the skewer through the cut you’ve just made on that side. 8. What results is a piece of potato that looks like interlaced fingers. 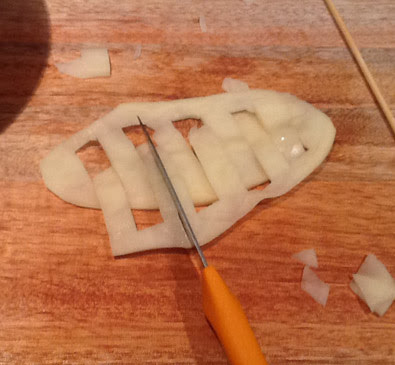 . . Clean up any frayed potato edges by cutting them off, because you’re almost there now. 9. Slice each strip in half. This last step is key, as each cut separates the links in the chain. The first time you attempt this, it may not give you a full chain. You may end up with a link or two, but keep at it. If you practice this two to three times, you’ll have it down. Then, you will noticeably get faster when you set out to produce it again and again. You may ask whether or not it’s worth the trouble. Chef André told us that you want to enhance the experience of your guests, make their meal memorable. “If you put a fried potato chain on a customer’s plate, they will never forget it,” André Soltner. I went home and cut up potatoes until I got this skill down. Now, I too am sharing the experience. Thank you, Chef André. Heidi Tickle is a current International Culinary Center student in the Classic Culinary Arts Honors Program. She has over 16 years of experience managing teams and writing policy within financial services. She most recently started a hot sauce company, which led her to The International Culinary Center for continued education. Heidi also enjoys writing for her blog, Tickle Sauce. 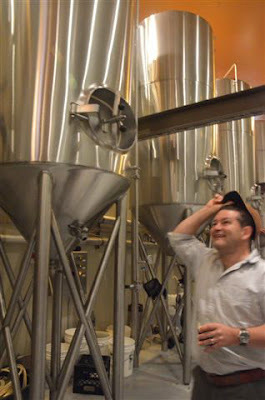 On Saturday, May 26 The International Culinary Center organized an outing for students at the California campus to the TCHO Chocolate Factory, followed by a tour and tasting with the brewer at ThirstyBear Brewery. 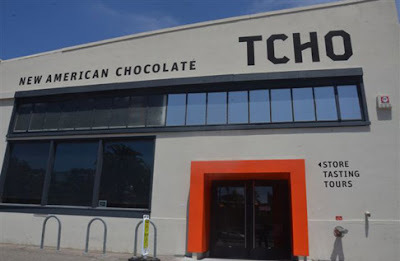 The TCHO experience included a presentation and factory tour with one of the most knowledgeable and entertaining chocolate experts in town, as well as an in-depth guided tasting of the flavor-driven, artisanal chocolate. TCHO is a luxury chocolate maker based in San Francisco, California that partners directly with farmers and cooperatives to improve growing, fermentation, and drying methods and teach them to create specific flavor profiles in their cacao beans. Its factory and world headquarters are located on Pier 17 along the Embarcadero, in the city’s historic downtown waterfront district. TCHO’s core principle is flavor; and the company has developed a Flavor Wheel as it’s roadmap for sourcing beans. 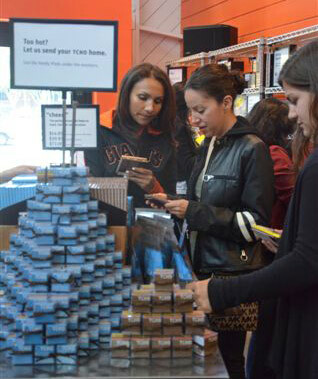 It also, of course, helps customers learn about the products they are enjoying. The Flavor Wheel uses six adjectives to describe chocolate: chocolatey, citrus, nutty, fruity, floral and earthy. The second unique principle that TCHO follows is the TCHOSource program that is “designed to obtain the best beans in the world while enabling the producers of those beans to earn a better living.” TCHO directly invests in cacao farmers and provides them with the technology and knowledge to improve their businesses. It was interesting to learn that most cacao farmers have never tasted chocolate made from their own beans. Why? 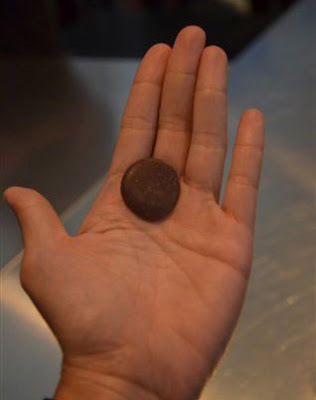 The growing climate is too warm for chocolate! After the presentation, students tested all of the TCHO’s chocolate offerings. The first was the 99% unsweetened with cacao from Ecuador and Peru… so no added flavors or sugar! We moved on to Chocolatey, which is a single origin chocolate made from Ghanaian beans. It was rich with a fudge-like flavor. Next was Fruity, single origin from Peru at 68% cacao. It was bright with hints of cherry. Nutty was also single origin from Ecuadoran beans and slightly sweeter at 65% cacao. We finished the dark chocolates degustation with Citrus from single origin Madagascar beans at 67% cacao. And then, of course, there was the milk chocolate. And though dark chocolate is very popular right now, the United States is still the number one consumer of milk. Everything was tasty and the 10% discount in the store sweetened the deal! Just after visiting the TCHO chocolate industry, students walked through the streets of San Francisco to find the ThirstyBear Restaurant and Brewing Company in the SoMa district. In a city with quite a few breweries, ThirstyBear is the first and only to be certified organic. Here we met brewmaster Brenden Dobel who brought us on a tour of the small brewery and led us though a beer tasting. We sampled the following four beers: the Polar Bear Pilsner, a “Bohemian-style” beer brewed with Munich malts; the Kozlov Stout – a black ale brewed with black malt, chocolate malt, and roasted barley; the strong American-style IPA; and the refreshing and citrusy Valencia wheat beer. I noted some crossover between the seemingly two different products —the concept of terroir relates to both cocoa and hops growing regions and affects the flavor of chocolate and beer. Also, the adjectives used to describe chocolate and beer are similar. And although we did not do a chocolate and beer pairing, that is definitely up next! Sophie Spano is an intern at The International Culinary Center, studying foreign languages and business at the Université du Sud Toulon Var which is located in the southern France. 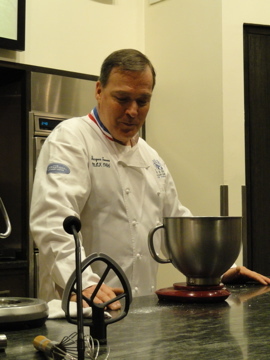 Last week I went to Chef Jacques Torres' demo on viennoiserie. I was curious to see what Mr. Chocolate would do. Obviously he is a brilliant pastry chef who made a name for himself before he opened his chocolate shop. Chef Jacques explained that other than chocolate, the first few units we study in the Classic Pastry Arts program (tarts, bread/viennoiserie, etc) are his favorite things to make. I guess it makes sense when you think about it. There is something incredibly satisfying and surprisingly relaxing about making a croissant or an apple tart. Plus is there anything better than a freshly baked pain au chocolat? First things first, he talked about yeast. He likes using fresh yeast. It is sold in bricks and kept cold. As he explained, it should always be crumbly... if it's not, it's too old. For both the croissant and brioche recipes he used, he mixed all the ingredients together, not bothering to make a preferment. Next, Chef Jacques showed us how to make croissant dough (which can be used to make pain au chocolat and danish, among other things.) The procedure was more or less what we learn in class. He did emphasize the importance of a long fermentation—you should always let your croissant dough proof overnight in the fridge, he said multiple times, as it helps develop the flavor and cut the sweetness. This wasn't news to me, but it was nice to have the concept reinforced. What was news was that you can replace about 10-15% of the sugar in a croissant recipe with trimoline, an invert sugar. This will give it a good flavor and a nicer color when it is baked. I'll have to try this sometime—I'm really curious to see how it works. Then he showed us the process of turning the dough. His method is to cover 2/3 of the rolled out dough with butter, then fold the dough up in the equivalent of a single letter turn. Then roll out and make one double turn and then one single turn. That's it. Let proof overnight in the fridge, roll out, cut, bake, eat. 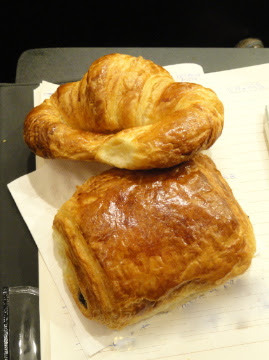 Speaking of eating, he served fresh croissants and pains au chocolat. There is nothing better than a pain au chocolat fresh out of the oven—it's light and buttery and the chocolate is still melted. Gosh they were good. For the bomboloni, he made a "light" brioche dough. Since the dough would be fried in oil, he explained, you don't need so much fat, so he cut down on the eggs and butter (but still added plenty). He showed us when to add the cold (but slightly softened) butter: once the gluten in the dough is developed enough that it pulls away from the sides of the mixing bowl and forms a ball. It takes a while for the butter to become fully incorporated into the dough, so you should add it cold to ensure it doesn't melt from the friction of the dough rubbing against the bowl—you should also use a sturdy mixer or you could end up burning out the motor (as Chef Jacques almost did). To fry them, form them into tight balls and let them proof. 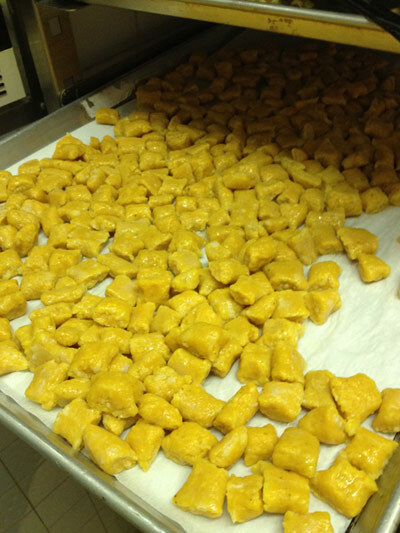 Then drop them into a pot of 160°C oil and cook until they are golden on both sides. Take them out of the oil and roll them in granulated sugar then fill them, apparently any filling is acceptable. Chef Jurgen (who happened to be sitting in on the demo) suggested his favorite, apricot jam. Chef Jacques scoffed (jokingly, of course) saying that apricot jam is cheap and in France they use raspberry jam. His favorite filling is pastry cream—what he was using in the demo—because when you throw a pastry cream filled bomboloni at someone it will stick to them better than a jam filled one would. Good reasoning, I think! 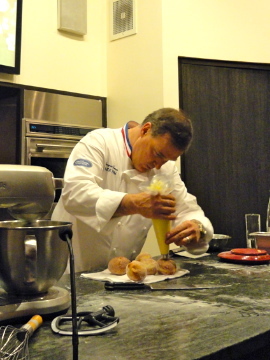 Chef Jacques, interestingly, will not use pastry cream powder for his pastry cream, opting instead for cornstarch. He pointed out that no one really knows what is in pastry cream powder. Chefs Jurgen and Rudy tried to object but it was futile. Chef Jacques was right, they didn't really know exactly what was in it. Honestly, I couldn't taste a difference in the pastry cream, except to note that it was exceptionally smooth—partly because he enriched it with a bit of butter once it cooled slightly. Overall an excellent demo; I learned a lot and thoroughly enjoyed myself. I can't wait to try out some of the tricks he showed us at home... and then eat the results! Mercedes Wilby is a student in Level 3 of the Classic Pastry Arts program. On her blog, Pastry Place, she chronicles her culinary exploits at The International Culinary Center, throughout NYC, and in her own kitchen. The International Culinary Center will be holding its fifth annual Hot Dog Eating Contest this Wednesday, May 23 from 3:30 – 5:30. This is and will be a fun and exciting day for The International Culinary Center and will give students the opportunity to compete with and against various Chefs and against each other. While the hot dog-eating competition is considered the main event, there are also three other events and opportunities for students to participate, win prizes and raise money for the school. The Main Event will feature competitors represented by each class level in a race for hot dog glory. Each student will be tasked with eating a 30-inch hot dog. Note that the hot dogs and buns are made in-house so any volunteers to help prep these are much appreciated. 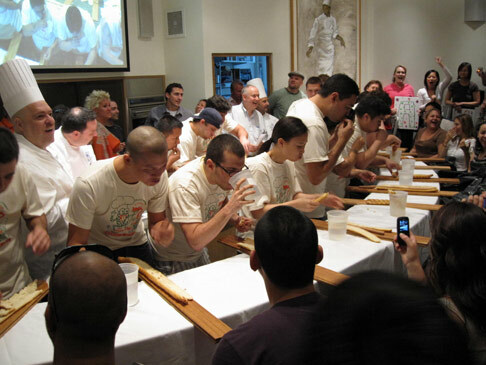 The winner of the hot dog-eating contest will not only earn the title of “International Culinary Center Hot Dog Champion of 2012” but also receive gift certificates to various establishments throughout New York City. New to this year’s event is the Spicy Dog Quick-Fire Challenge. To be eligible, students must apply with Chef Jeff Butler and then selected students will be paired with a Chef Instructor. The student/chef pairs will create a recipe using Sabrett spicy hot dogs and will compete against other for the best recipe. The winner of this challenge will receive a free three-day charcuterie class at The International Culinary Center. Also new to this year’s competition will be a beverage challenge. The goal of this challenge is to create a non-alcoholic beverage that would pair well with a Sabrett hot dog. Students are allowed to use any ingredients as long as they are non-alcoholic. The winner of this challenge will receive a Blendtec Blender. Finally, there will be a fourth competition geared towards each of the six levels of the Culinary Arts career program at The International Culinary Center. Each class will compete to raise money for The Friends of FCI scholarship fund. This fund directly benefits International culinary Center students through emergency funding for students, enabling students to continue their education in times of financial need. The class level that raises the most amount of money in this competition will receive a private in-class demonstration with Chef Josh Capon of Lure Fishbar and B&B Winepub and Chef Pat LaFrieda of LaFrieda Wholesale Meat Purveyors. Students are urged to come up with fun, innovative and creative ways to raise money for this essential fund that benefits fellow students. The Hot Dog Eating Contest, May 23rd 3:30 – 5:30, is a fantastic opportunity not only for The International Culinary Center students to get involved and participate with Chefs in an out-of-classroom atmosphere, but also an amazing opportunity to give back and raise money. 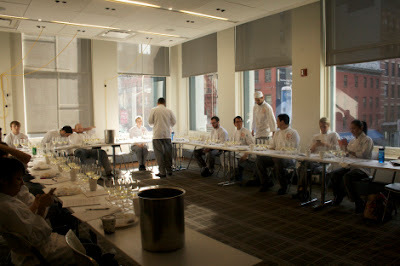 For any questions, comments, or concerns please contact Chef Jeff Butler at jbutler@intlculcenter.com. Kirby Preroff is a current student in Classic Culinary Arts, Level 4. The International Culinary Center welcomed Chef Brad Farmerie to our California campus on Monday, April 16 for a Q&A with students. Chef Farmerie is a partner and chef in the award winning AvroKO Hospitality Group. AvroKO is a unique design and concept firm that also owns and manages four restaurant properties in Manhattan. The group will soon be making their debut on the West Coast with Fagiani’s, set to open in one of Downtown Napa’s most historic buildings. 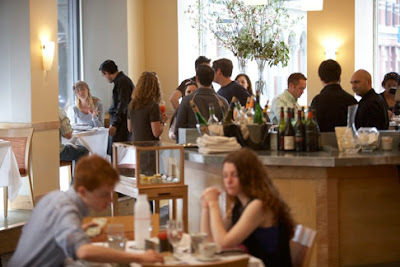 AvroKO’s first restaurant, Public, opened in New York City, nine years ago. Brad noted that, at first, the public was a bit skeptical of the cuisine, but he was committed to cooking food that inspired him. His vision earned this unique “Australasian” restaurant a Michelin star. Their second restaurant, Saxon + Parole, opened four years ago under the guise of the Asian fusion/British colonial, Double Crown. Brad acknowledged the importance of reinventing oneself. The new reincarnation of the space features “grilled meats and aquatic delights.” Both restaurants each boast adjacent cocktail bars with an array of spirits and intelligently crafted, innovative cocktails. Chef Brad’s culinary career launched in 1995, following extensive world travel. He found that his passion for food and travel trumped mechanical engineering, and he enrolled in culinary school in the UK. When asked about his culinary style, and the inspiration for Fagiani’s, he explained that international travel experience is at the core. The execution of his vision happens via quality ingredients presented simply, but layered with complex flavor. While on the topic of his background, Chef Brad shared a recent, eye-opening collaboration with Nestle where he was invited to partner with them on product development. His initial reaction was, ‘Why would I be interested in something with a corporate giant like Nestlé?” He then realized that Nestlé sells one million pieces of food a day, while he may serve 200 people a night, and that by working with Nestlé, there was enormous potential to impact millions of Americans. Chef Brad offered wonderful advice throughout his presentation, and it was apparent that he had an impact on the attendees, and perhaps even recruited potential employees! He concluded by saying that a cook or chef has to find the food and environment that makes him/her feel excited every day at work. This is different for everyone. But in order to be successful, you must have passion and enjoy what you do. 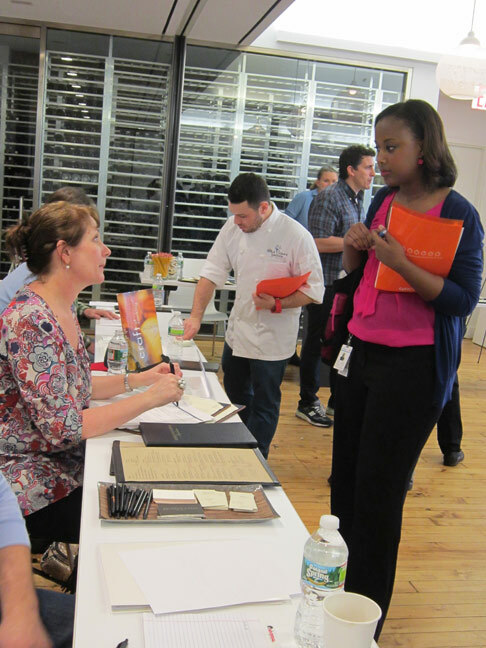 Current students and alumni of The International Culinary Center had the opportunity on Wednesday, March 21, to meet with over 50 companies in the food industry. Notable employers included a line-up of some of the best culinary talent in New York City, like Mina Restaurant Group, ABC Kitchen, James Beard Foundation, and Craft Restaurant Group. 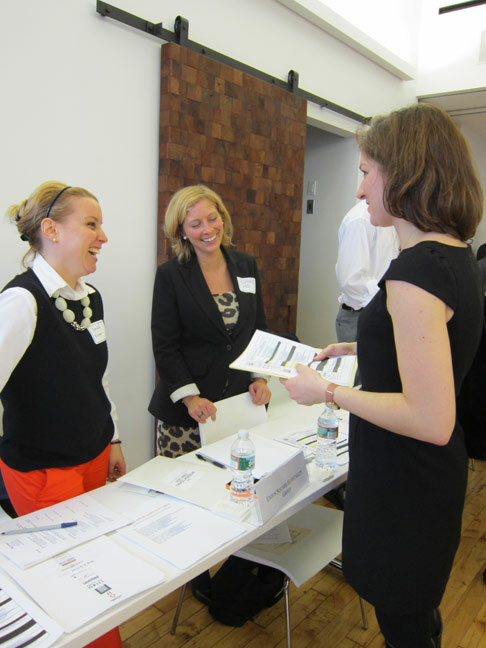 A remarkable number of 215 students and alumni came prepared with resumes, eagerly stopping by tables for a brief introduction and potential leads to job openings. Major food publications and catering companies also attended the fair which certainly sparked an interest with students looking for opportunities outside of the restaurant kitchen. I spoke with representatives from Abigail Kirsch Catering, Saveur magazine, and Dean & DeLuca, to name a few. A successful and impressive turn out at the career fair only reinforces one of the obvious benefits of attending culinary school in a city: the relationship between The International Culinary Center and top names in the industry. Even if you’re already employed, stopping by the career fair at school helps you see your options and, of course, network with potential employers. It’s important to know how to navigate an industry, an especially competitive one that has no sign of slowing down anytime soon. 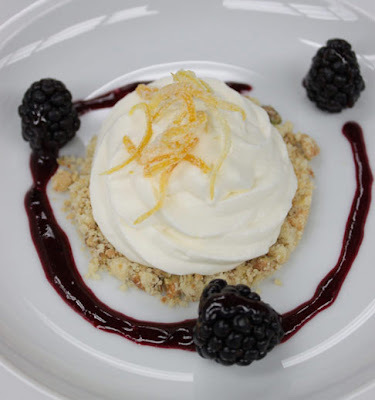 Alexa Magarian is a recent graduate of the Classic Pastry Arts program. She works as a Pastry Cook in New York City and continues to pursue her passion for writing, learning, and of course, all things sweet. 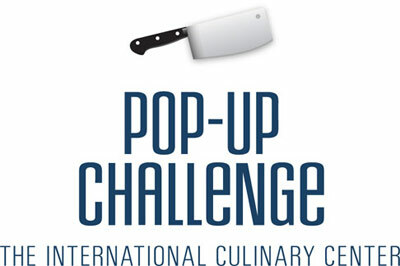 The International Culinary Center presents a Pop-Up Restaurant Challenge! Students at the International Culinary Center have an exclusive opportunity to design a menu and potentially have it featured in their own pop-up restaurant at L’Ecole. 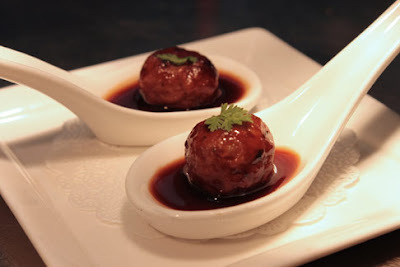 The objective is to create and execute an original restaurant concept. Students participating in the contest will compete in groups. Each group will create a four-course menu which can reflect any cuisine. If they pass this first round, they then have to create a tasting from their menu and present it to a panel of judges. One team will be selected to open a pop-up restaurant where their original menu will be served for two consecutive Sundays, February 12 and 19. How exciting would it be to see a menu come to life that you designed? One lucky group will get the chance to transform L’Ecole into their very own restaurant. 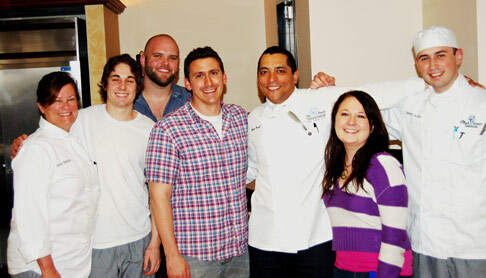 Check back soon to see who makes it to the final round, what the judges say, and which menu gets a spot at L’Ecole! 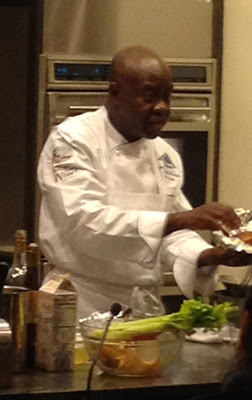 “Passion is what gets us into the kitchen, desire is what keeps us there” is what Chef Francois Kwaku-Dongo said as he sweated his aromatics for a sauce to go with his short ribs. This past Wednesday we had the honor of having Chef Francois, executive chef of The Wharf restaurant at the Madison Beach Hotel in Madison, Connecticut; join us for a demonstration on combining sweet and savory flavors in dishes. Chef Francois is the culmination of hard work and determination. To those who think they’re already too old to be great chefs, that they didn’t start cooking at the age of 15, take solace in the fact that Chef Francois came to New York City from Côte d’Ivoire at the age of 24 and started out delivering pizzas. He worked his way up from dishwasher to executive chef of one of Wolfgang Puck’s restaurants. But he did not stop there; he is also partner of the Omanhene cocoa bean company in Ghana and sells his chocolate to chefs and restaurants worldwide. I had the pleasure of helping Chef Francois with his demonstration. I was in charge of setting up his mise en place: cutting carrots, celery, and onions into macedoine; measuring out his flour, butter, and panko. The real work didn’t start until he asked me and my friend Ryhan to roll out his sweet potato gnocchi. 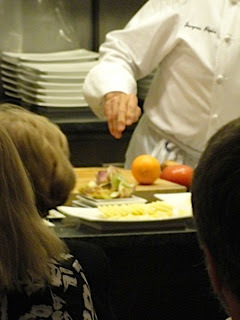 Chef told us, “It is a chef’s goal to teach their cooks how to do something better than they can. That way, when we are not there, we know they will do it perfectly each time.” Well, I can say I learned how to roll gnocchi (decently), but I’m thousands of gnocchi away from being anywhere in Chef Francois’s skill range. For the demo Chef Francois made Mustard and Chocolate Braised Short Ribs served over Sweet Potato Gnocchi. As Chef braised the short ribs, the aroma lured in passersby to poke their heads into the kitchen and find out what was that delicious smell could be. But Chef Francois did more than cook for us, he painted us the story of his journey through the many kitchens that fostered his growth and fueled his passion to cook. The gnocchi represented the beginning of his career in the Italian kitchen that would spur his desire to cook. The braising represented his desire to master a myriad of cooking techniques in the kitchen. And the use of chocolate as a crust for the ribs represented his humble beginnings picking cocoa beans on his family farm in Côte d’Ivoire. The ribs were cooked perfectly and were very tender. The gnocchi were soft and delicious. There was just the right amount of chocolate and mustard on the ribs; neither of them overpowered the dish, but instead brushed your taste buds lightly, so ephemerally that they were there and then gone. Jonathan was born and raised on Long Island and grew up eating and loving great seafood. 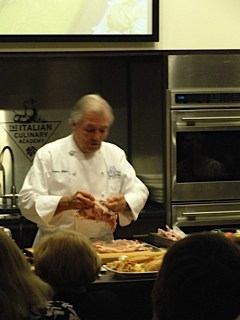 His mother is a great cook and his grandfather was an Italian chef; both instilled in him a love for food. He is passionate about using fresh, local ingredients in his cooking and is currently enrolled in the Classic Culinary Arts Honors Program. I’ve been meaning to blog but things just got crazier and I got busier and then procrastination kicked in. But I’m glad I finally have time to write. I have so much excitement right now. 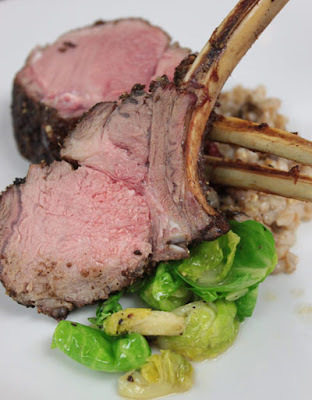 I finished Level 2 of the culinary program on Tuesday, December 27 and I am psyched about starting Level 3. For levels 1 and 2, we are taught the French techniques and we cook a variety of meats. In level 3, we will be cooking under time pressure and we will be working in a simulated restaurant kitchen setting. I wanted to focus this post on how much I look forward to watching Top Chef Season 9 every Wednesday. Now, I actually understand everything that the competing chefs talk about and all the descriptions under the dishes that they make. Before coming to The International Culinary Center, I was a home amateur cook and during that time, I felt I was on the opposite side of where the competing industry chefs were on the show. Now that I’m about to start Level 3 and I’ve been in school for three months, whenever I watch Top Chef this season, I feel I am a part of them. I understand their jargon, and their concerns about not sending their best dish forward. I also have a better understanding of some of the dishes that they’ve cooked because I cooked them myself in class! And how cool is that this season of Top Chef, it’s in my home state of Texas! ATX pride! It’s obvious whom I’m rooting for to win this season. It looks exactly like the picture in our textbooks except it’s cuter! I heard that we would be breaking down a pig in Level 4 during our charcuterie unit. 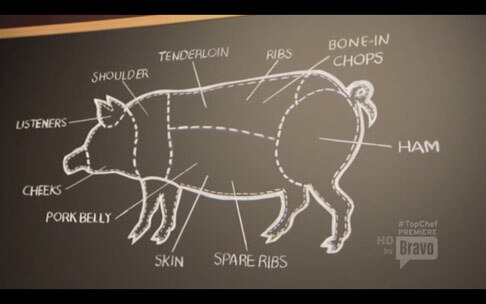 It’s a good thing that Chef Janet was our Level 1 sous chef so we got a feel of what is expected for butchering. One of the contestants got sent home because he incorrectly broke down part of the pork chops that also had the tenderloin attached with it. He wasn’t even allowed to cook. In the sixth episode of Season 9, three minutes in, I shouted out with glee! Mother sauces! A mother sauce is a base for other sauces: béchamel, velouté, espagnol, hollandaise, and tomate. 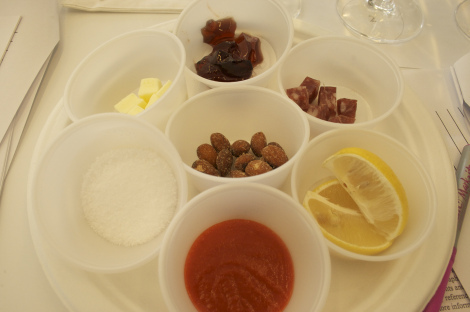 Their challenge was to make a new sauce that stems from their mother sauce. 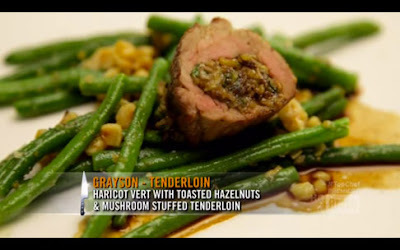 Whenever I watch this season of Top Chef, I feel like it is an interesting review session for me. 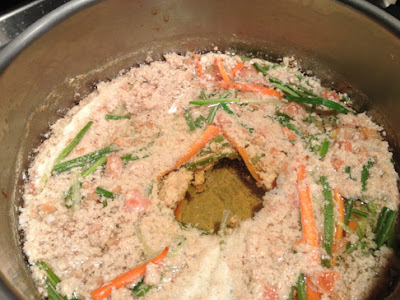 It was surprising that none of the chefs used a roux. 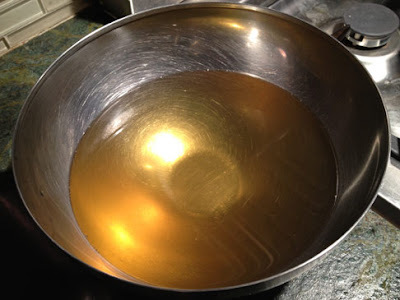 A roux is a thickening agent and in school, we always mix equal amounts of butter and flour together. In the third and sixth episodes, one of the chefs made a génoise cake. We made that in Level 2! I feel so inspired that I'm going to start my menu project (culinary students create a unique menu with beverage pairings, recipes, illustrations, and food costing) now. I have my eye on the award that will be given during graduation for the best and most creative menu project! Another Christmas has come. Feeling very accomplished by completing your last minute Christmas shopping you are rushing towards your local supermarket to purchase a leg of ham. You make a beeline for the meat aisle and look for the biggest leg that will feed the most people. But have you ever considered checking where this leg of ham (or at least the pig that it once belonged to) came from before it became this oh so tasty Christmas meal? Amongst the chaos and commotion of Christmas, it is often easy to forget these festive details. There use to be no such terms as “sustainable” and “organic” and food was exactly that – food. Gone are the days when the milkman delivered the crates of glass bottles fresh to peoples’ doorsteps and they knew the farmer that it came from. But in this ever-changing world, it is still very possible to know your suppliers well. There are many reasons why we should become more conscious of what we are purchasing and choose organic and local foods, over mass-produced animal products and produce. When you purchase local organic foods you know it’s fresh without the use of mass amounts of insecticides and pesticides. Produce has not been genetically modified in any way and meat is not injected with antibiotics or hormones. Purchasing local food supports your community which in turn helps the local economy and the carbon footprint is much less, as the food doesn’t travel as far. If that isn’t enough reason for you, well locally grown, organic food just tastes better! Much of the beef on the supermarket shelves these days have been grain fed, as opposed to eating what really makes them thrive – good old grass. It’s cheaper for the manufacturer and, admittedly, it makes for a cheaper piece of meat on the shelf for consumer. But is it really worth sacrificing the flavor and nutrients we would otherwise get for paying a few extra bucks? Most of us know what happens on those factory farms and what the battery cage hens go through, yet many people still choose to eat this chicken and the eggs they produce because it’s cheaper. It isn’t simply for ethical reasons that I choose organic meats over the cheaper variety—I’m a big believer that the better a life an animal had and the more it was treated with respect while it was alive (and even during the slaughter process for that matter), the more wonderful the meat will taste. 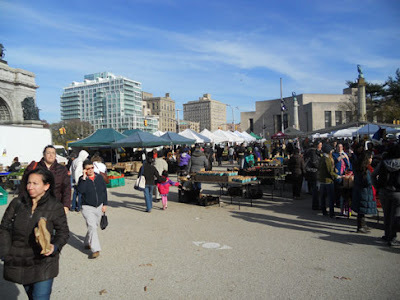 There are loads of local farmers markets around New York City that are open on various days during the week and weekend. You can find one in your neighborhood at www.grownyc.org. 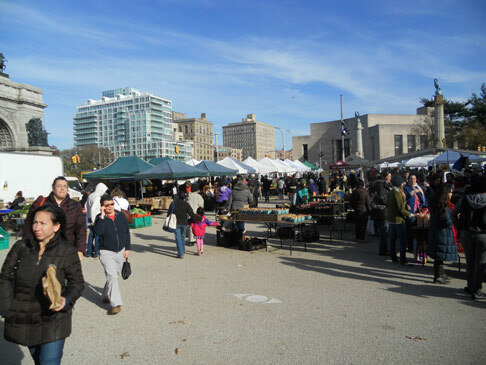 These markets not only include produce, but also meats, seafood, breads, grains, dairy, and much more. There are also many butchers appearing around the city that sell only organic and grass-fed beef. Every time I walk past my local organic butcher they are jam-packed with customers. This is a sign that consumers are indeed becoming more aware of the importance of what they are eating. So on Christmas day, if you’re lucky enough to eat a leg of ham, hopefully it once belonged to a pig that got to roll around in the mud and ate well itself. And while you’re at it, slather on some cranberry sauce made from locally grown cranberries. You may just enjoy it that much more.